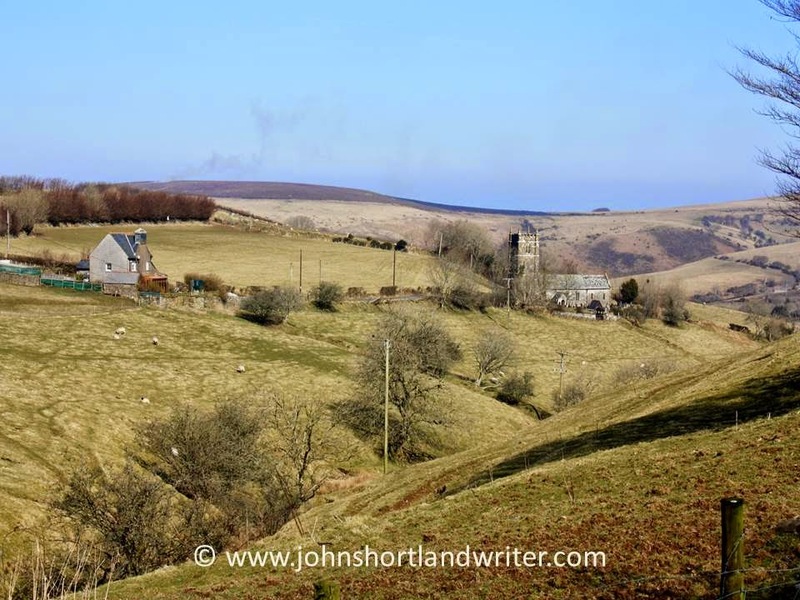 Ask those that know Exmoor – England’s smallest National Park – to conjure up just one image of it and you would get a number of different answers. 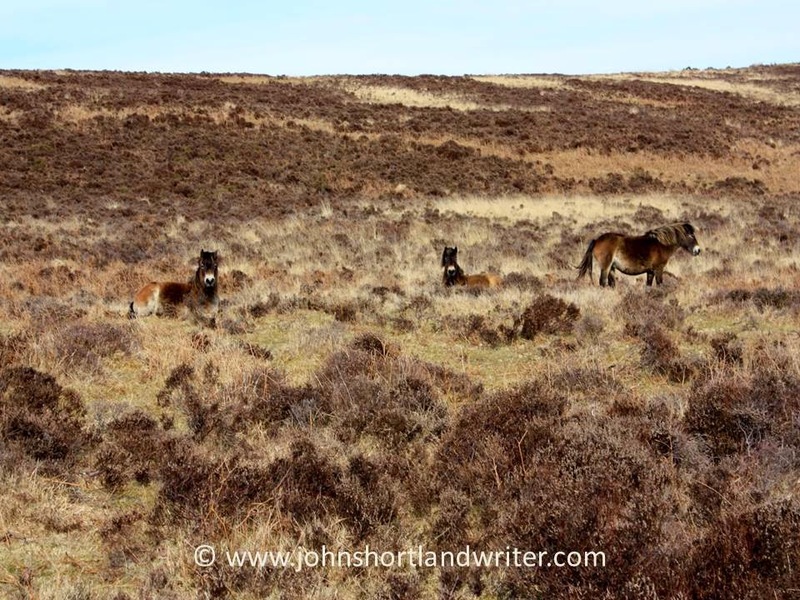 For some it is the wild ponies, others the rushing streams but mostly the answer would be the sea or the moorland. 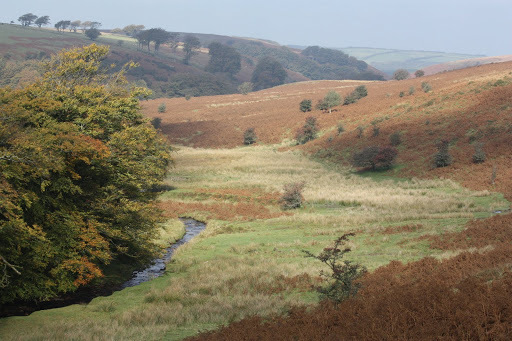 On Exmoor you are never very far from either. 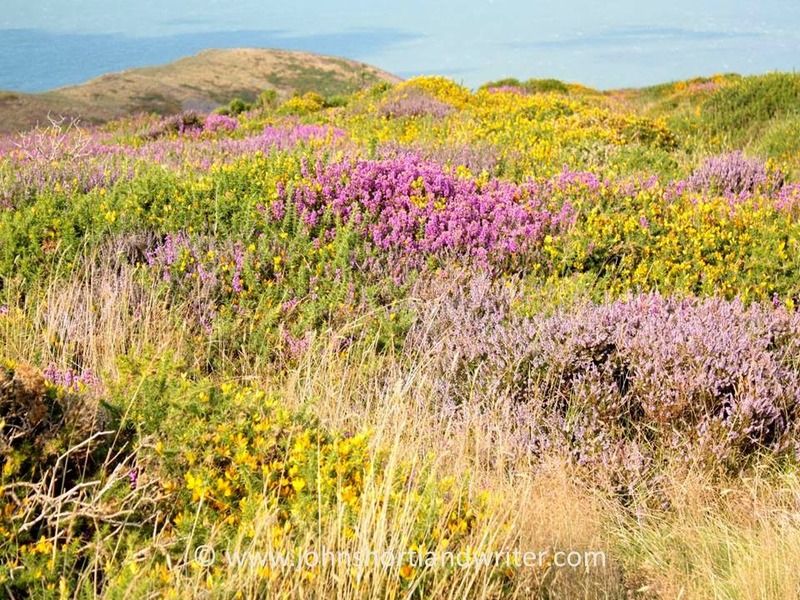 At this time of year the moors are, perhaps, at their very best: awash with a purple haze of heather in bloom, speckled with the yellow flowers of furze – the local dialect word for gorse. 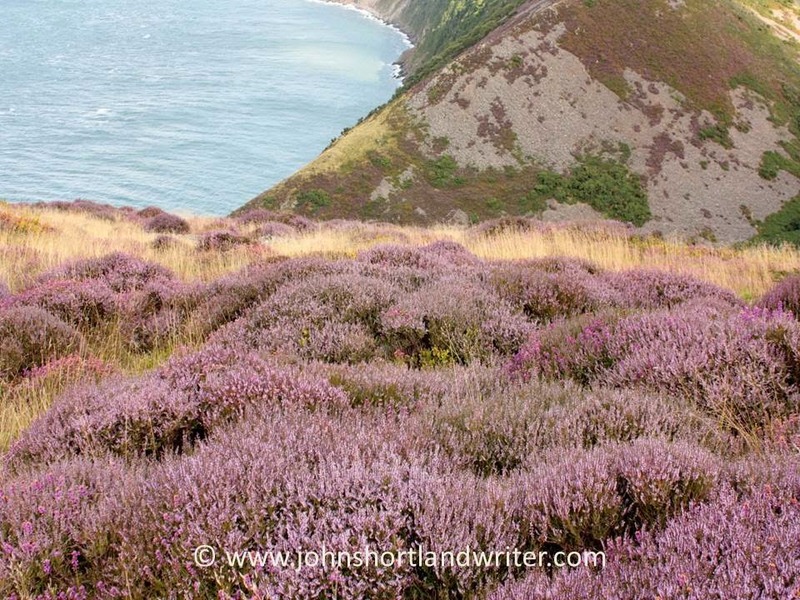 During the cooler months, however, the heather looks very different, drab browns and greens giving no hint of the glory to come. 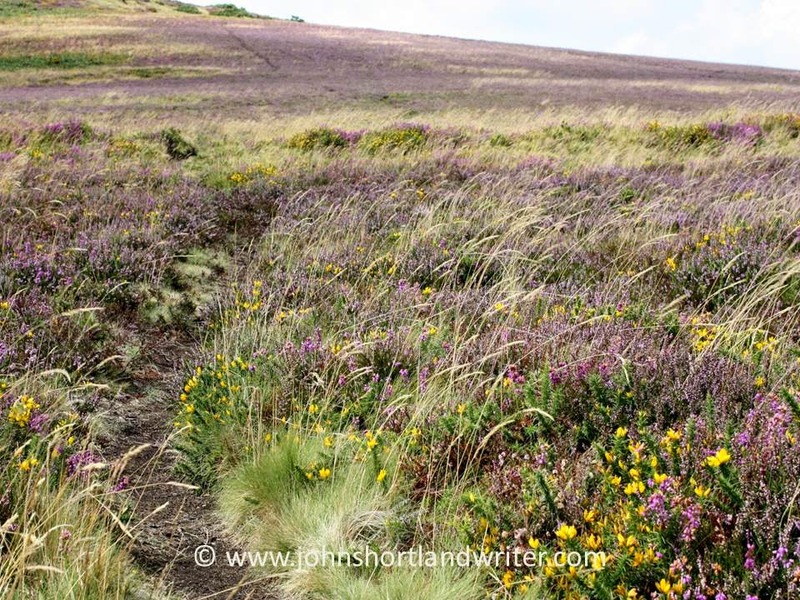 The heather is an important resource for animals whether it is food for the ponies, sheep or cattle that roam the open spaces or the deer. 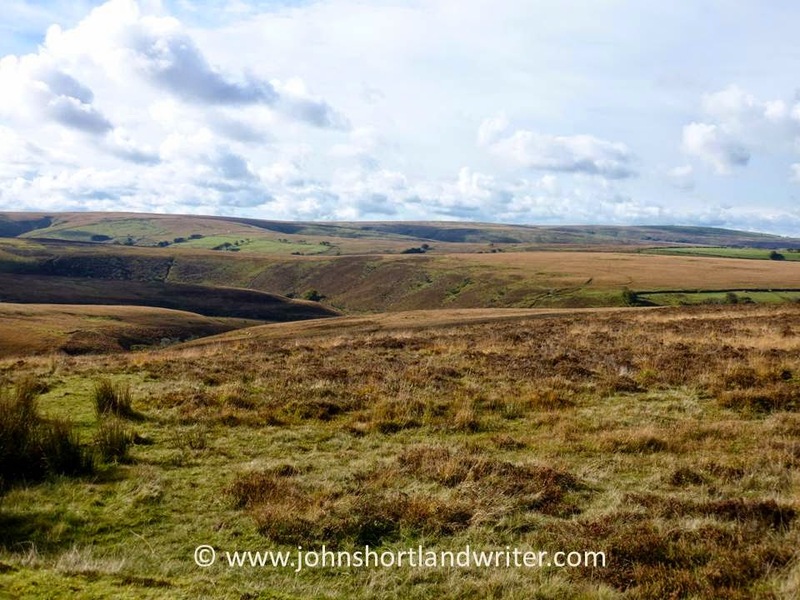 In the past – they died out in 1969 – black grouse fed here too, the record of their existence recorded in place names such as Heath Poult Cross, heath poult being the dialect word for the grouse. 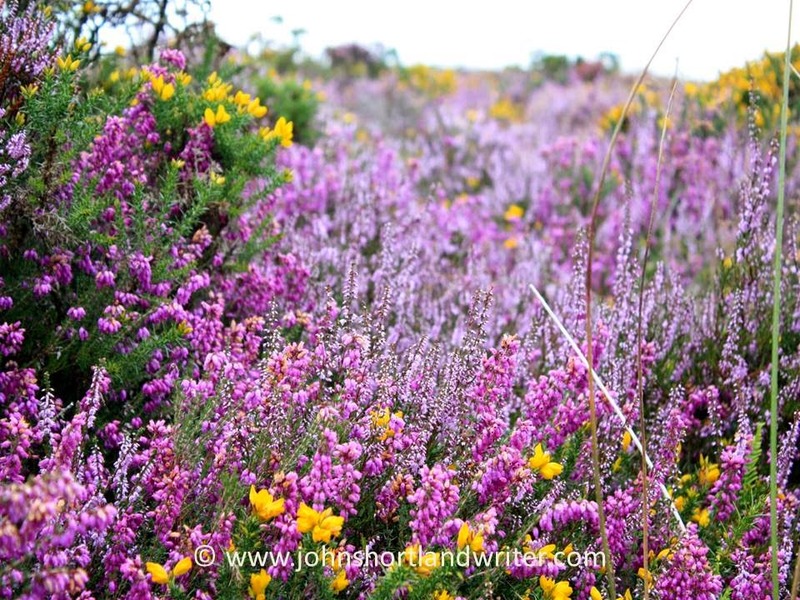 For other birds that nest close to the ground the heather protects them with its cover. 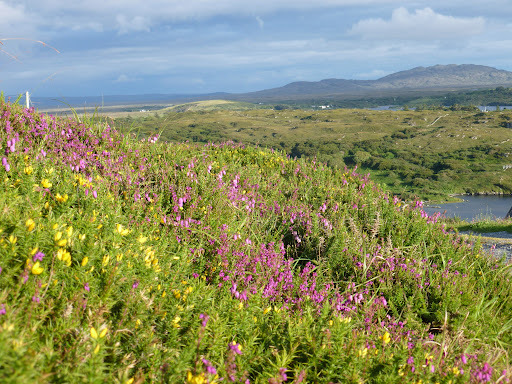 Although at a glance the heather all looks the same, there are three types, quite easily distingushable when in flower. Cross-leaved Heath (Erica tetralix) has paler flower clusters at the top of the stems; Bell Heather (Erica cinerea) is a rich crimson-purple in flower whereas the true Heather or Ling (Calluna vulgaris) is softer both in colouring and appearance. Together, they blend to create a colour mix of shadow and light. 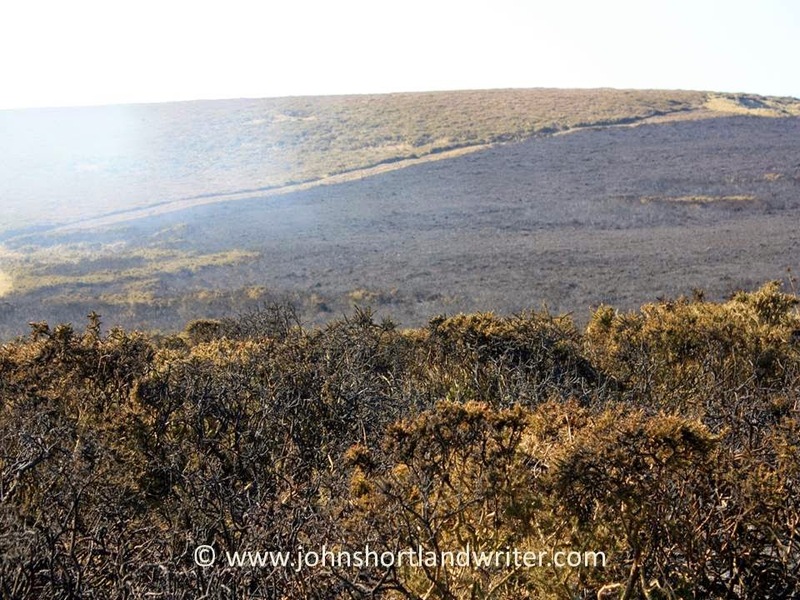 To keep the heather moorland in good order, controlled burning is carried out once the plants have become old and woody, an ancient method called swaling. Only selected areas are burned, usually on a five to ten year cycle between October and early April. The fires are watched carefully, not just to prevent their spreading to other areas but to ensure that the rootstock is not damaged from which the new, tender shoots soon grow. The burning of the moor is both exciting and interesting to watch for the smoke can be seen for many miles. It is difficult to imagine when the stems are blackened and charred that life will ever return. 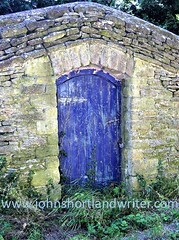 The photograph below shows the regrowth after four years. 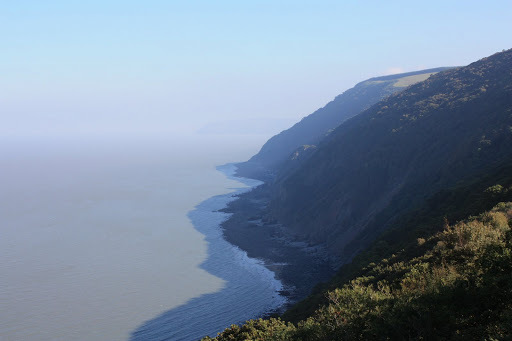 Exmoor has the highest cliffs in England and these are made even more dramatic by the moorland which extends to their edge, the heather even clinging to the steep sides as they tumble to the sea, caring little for the salt-laden winds that continually buffet them. 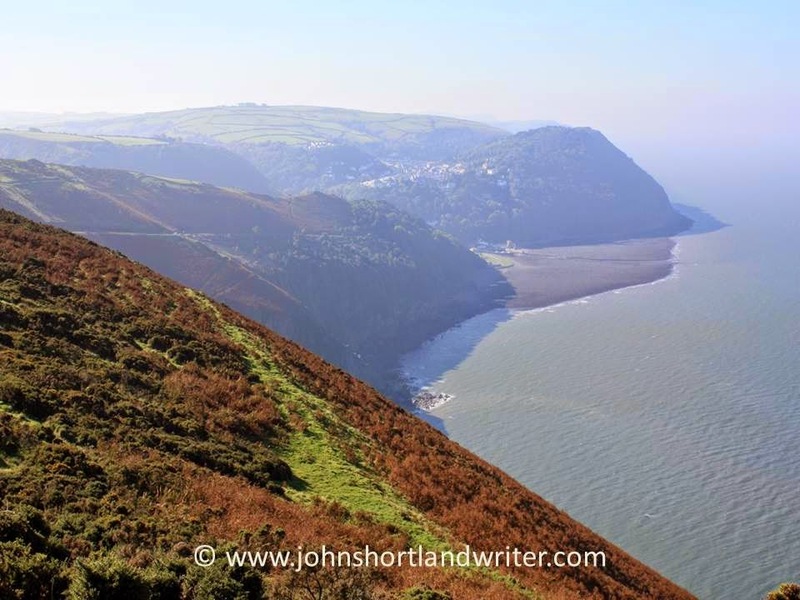 On a sunny day in August the combination of blue sea, purple heather, yellow gorse and blue sky, combined with Exmoor’s splendid views, is a sight rarely forgotten. 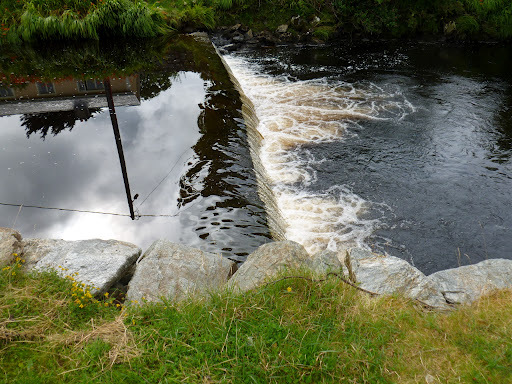 The west coast of Ireland is renowned for its beauty for the crashing waves of the Atlantic Ocean, with nothing to slow them down from the shores of America, have created inlets and pools, islands and crumbling rock face. It is a wild place with mile after empty mile of high cliffs, sandy coves and sheltered bays. Like the shadows that play on the surface of the water, the weather is forever changing as rain and sun alternate produce the contrast of lush green against granite outcrops. All along this coast there are ruins of the old crofts, now long deserted as the population left to find work and comfort elsewhere. Those that remained moved into more modern homes that look as if they have been dropped into the landscape for they sit at all angles, some looking out to sea, some with their backs firmly set to it as if hunkered down waiting for the next battering storm. 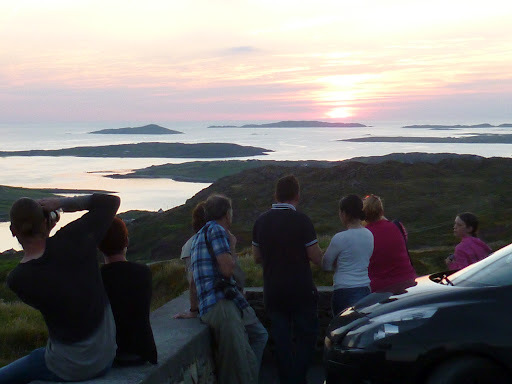 We – my partner, myself and some friends – had come to stay high on the cliffs outside Clifden specifically to visit the annual Connemara Pony Show, where the native ponies are put through their paces over three days. I have written of this in my last post (click here) and also mentioned how we came expecting rain and cool temperatures only to be blessed with such hot weather that we actually swam in the sea. 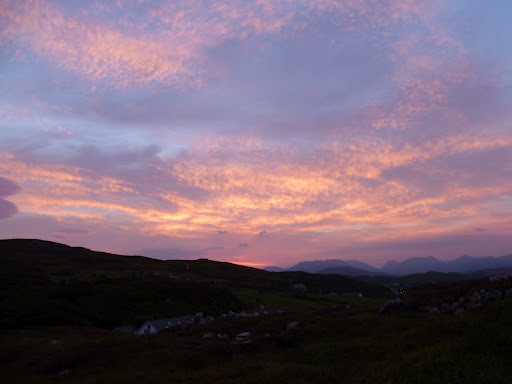 The fine weather meant that we were treated to some spectacular sunsets. 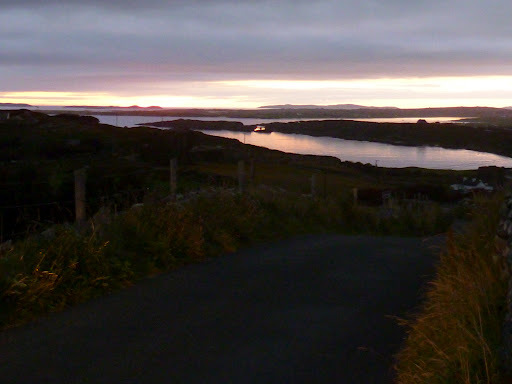 There are two roads that lead west out of Clifden, the Beach road and the Sky road. The first only goes a short distance but the Sky Road is an 11km loop that is a popular destination for both tourist and local alike on a clear evening. As the light begins to fade there is little to prepare you for the spectacle that will come later. 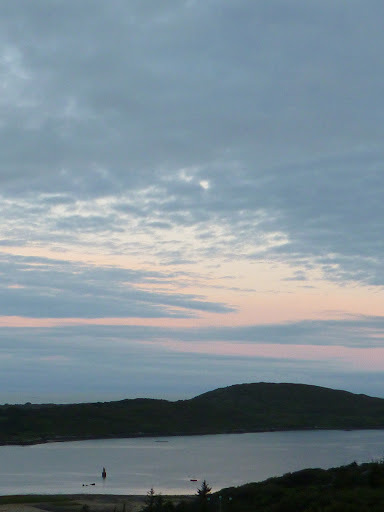 A greying of the sky with just the merest hint of colour as if an artist has slashed the palest of pink washes in a quick ‘Z’ shaped stroke. As the sky darkens further it would appear that the sunsets we have been promised will not materialise. 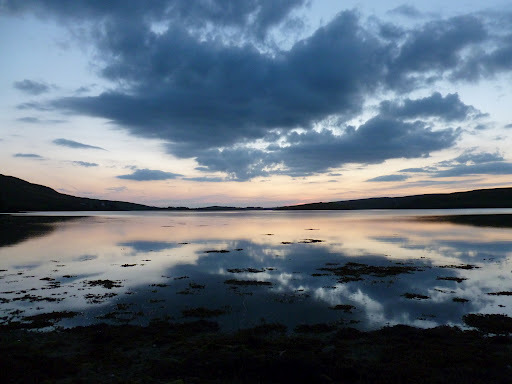 The sea changes in appearance at this point and becomes almost glassy or mirror like. 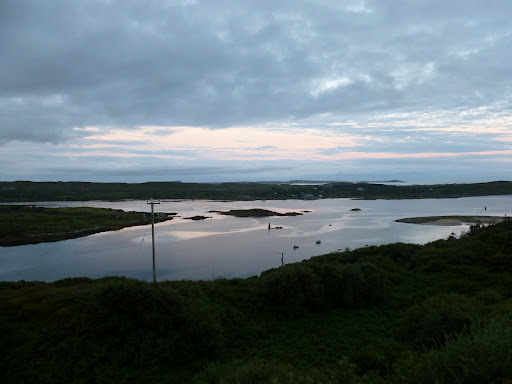 The dark line stretching across the water in the photo below is made by fishing nets stretched across the bay, invisible at any other time of day. 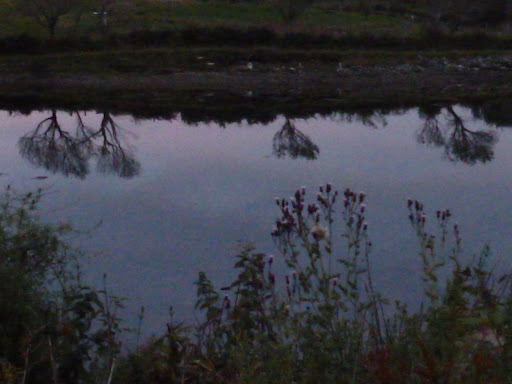 Trees, too, standing on the edge of the water cast their reflection in the stillness. 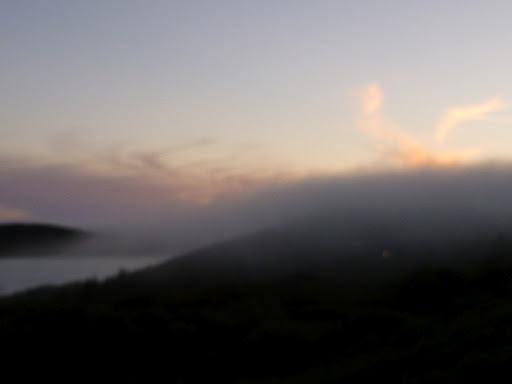 A shaft of light suddenly appears along the horizon, lightening up the landscape once again only to be hidden by a bank of seafog rolling in, determined to spoil our evening display, leaving just a hint of gold cloud rising above it. 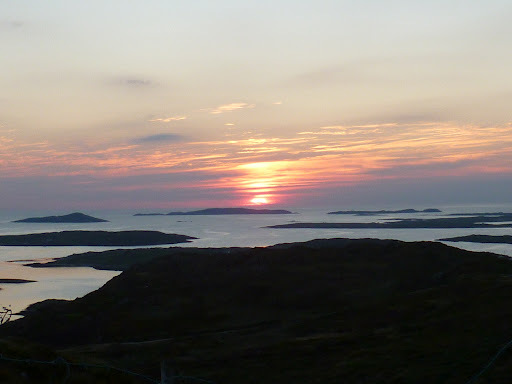 But, just as quickly it disappears again to reveal the sun disappearing over the horizon beyond the islands. We stay until the sun disappears completely and drive on imagining that the show is over but nothing has prepared us for this last finale seen as the road rounds a bend. The combination of cloud, light and darkness, of navy blue, black and pink, mirror imaged in the still water is quite breath taking. It seems unreal, as if it should be the backdrop to a Wagnerian opera; we stand on the sand speechless for no words are adequate. I had to share the sunset with others but waking early the next morning I stepped outside to be greeted by an almost equally spectacular dawn. 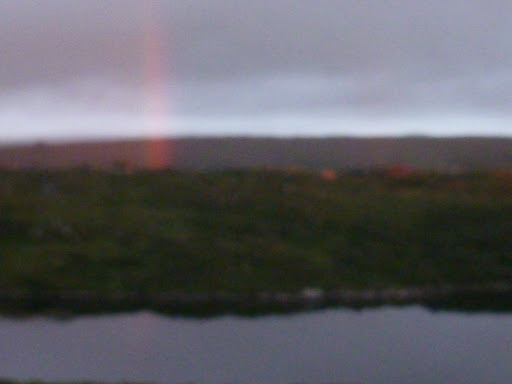 And what phenomenon created this vertical shaft of colour coming straight up from the sea? 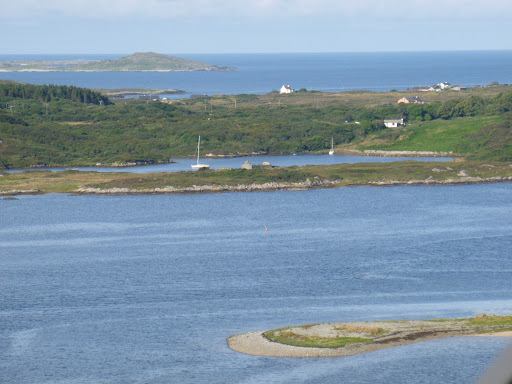 Rugged and beautiful, Connemara is situated on Ireland’s west coast. 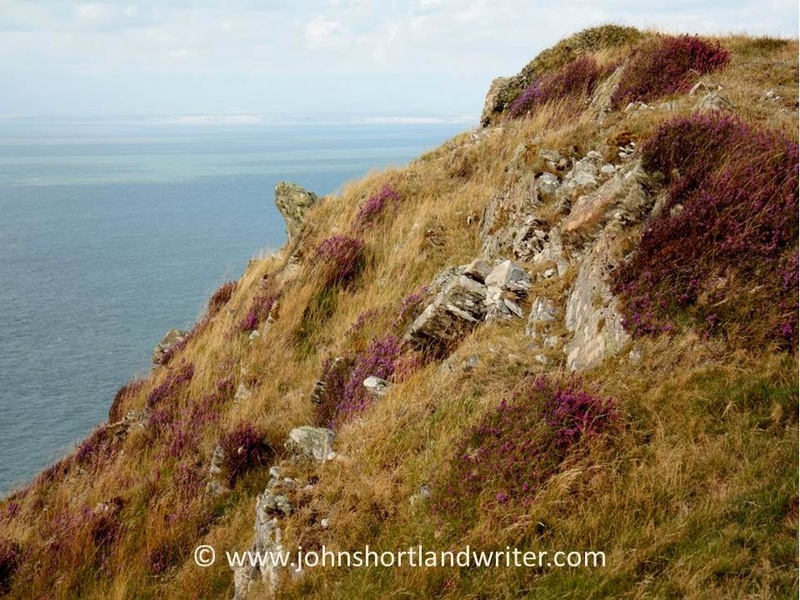 It’s a wild place: a rock strewn landscape softened by the lush green of field and bog; of purple heather interwoven with the golden flowers of gorse; of towering scarlet and purple fuchsia hedges; of blue sea and empty, sandy beaches and of vast skies. On a warm, summer’s day there can be no more benign a place yet when the gales and driving rain arrive, you are reminded that there is nothing but open Atlantic until you reach the shores of America. 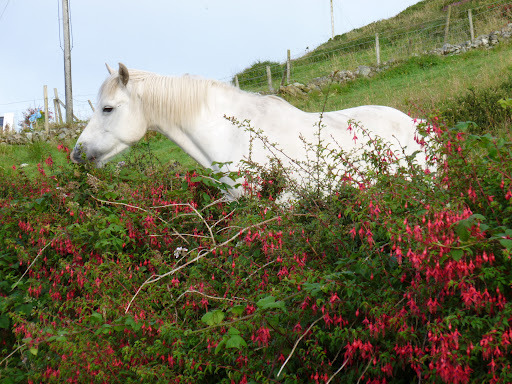 It is here that the Connemara pony, as enigmatic as the land that produced it – gentle but tough – developed. The origins of the ponies are lost in time. Some believe that they date back to the Vikings, others that the local breed crossbred with shipwrecked Spanish Armada horses. What is known with certainty is that during the 19th century they were crossbred with Hackneys, Thoroughbreds and Arabians until by the early 1900’s the pony bloodlines were being lost. In 1923 the Connemara Pony Breeders Society was set up to preserve the breed, the result being that the Connemara is now thriving with societies, clubs and shows worldwide. 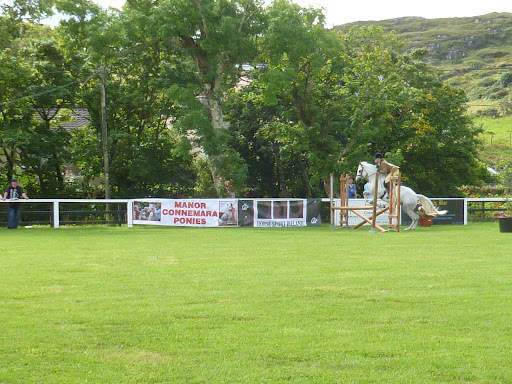 The most important of all of these shows – and rightly so – is the one of its birthplace, the Connemara Pony Festival at Clifden, held each year during August. 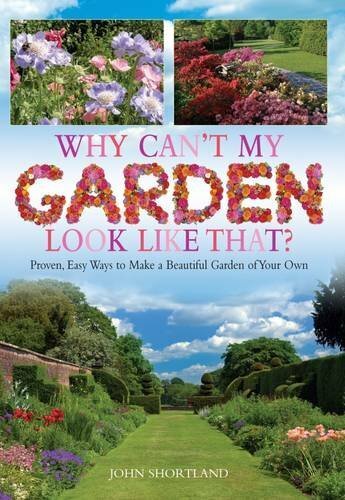 It is to the Festival that I was lucky enough to be invited last week. My interest in horses, I have to admit, is somewhat limited. I ride and (even if I say so myself) am quite good at it, despite only learning ten years ago but I do find the prospect of sitting watching horses for three days going around a ring rather daunting. But this is Ireland and the craic is as good as you would expect it to be – here you can wander in and out of the showground, the locals are happy to chat to you about anything and everything and the setting is superb: a small showground in the centre of a pretty, brightly coloured town bounded by a dark brown, peaty watered river and backed by mountains. And of course, there is Guinness! A bonus was the weather – hot and sunny, every day. I stayed and watched some of the jumping competitions before my attention waned. The standard of the riding was very mixed but fun was had by all and it was interesting to see how the children just climbed back on board and carried on without, it seems, a second thought. 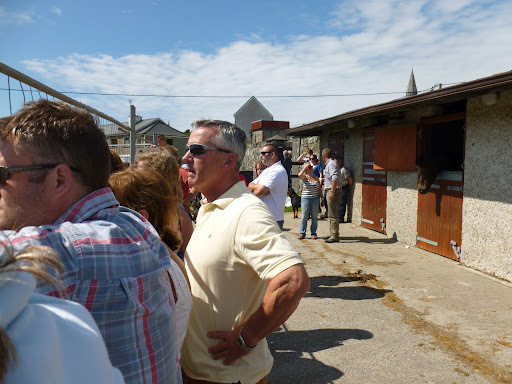 Perhaps that is why so many of the top jockeys are Irish …. However, when it comes to ‘loose’ jumping, I can stay all day. To watch the ponies move without the restraints of rider and tack, I find fascinating. Here, the atmosphere is very much more relaxed and the banter never ending. After a long day, what better way can there be than to end it with a stroll through the town, visiting a bar or two along the way? 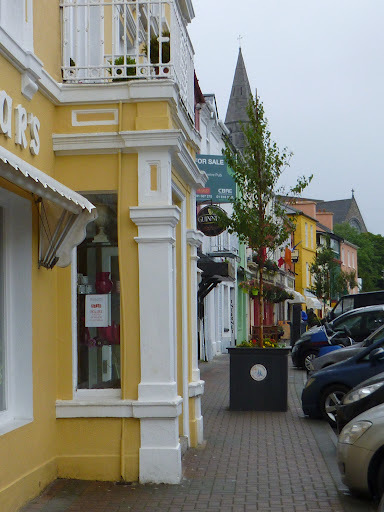 Clifden is also a stronghold of traditional Irish music and from every open doorway the sound of the fiddle eminates. 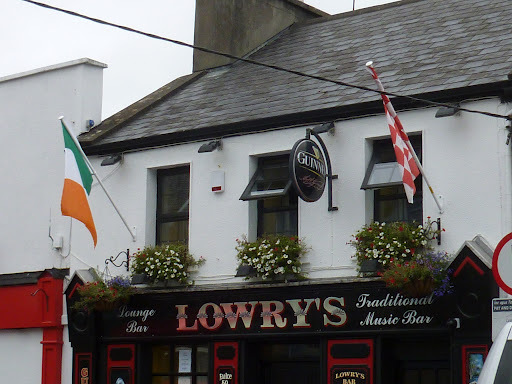 Traditional music has been a lifelong interest of mine and I have had all the elements of a terrific day out – horses, Guinness, Ireland, song and warmth. 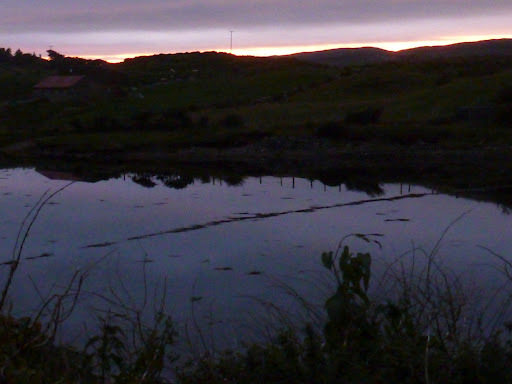 I walk back to my house, twenty-five minutes outside the town, set high up on the cliffs, as the sun begins to set. The perfect end to a perfect day. This seems an opportunity to talk of my own horse, Barney. A giant of a horse (who, by coincidence, also came over from Ireland), gentle, wicked and a lot of fun, he helped teach me to ride by ensuring, I like to think, that the saddle was safely underneath me when I landed after a jump. 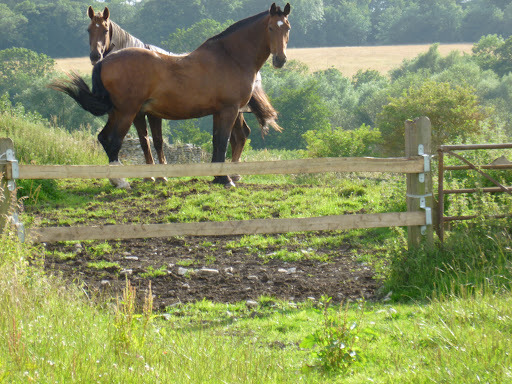 After months of treatment for lameness, he was ‘put down’ – a very sad day. However, I now have Bart who compared to Barney goes like a Ferrari. An ex-eventing horse, he is beautifully schooled and very disciplined, it has taken me a while to feel comfortable with his power and speed. 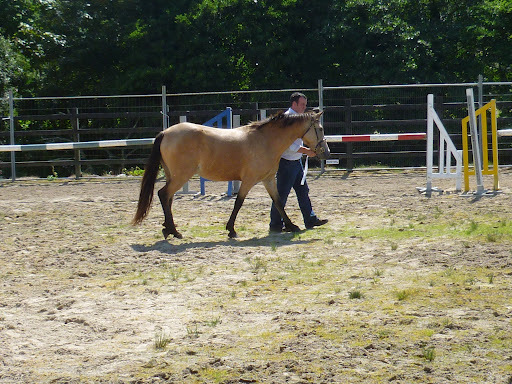 More of all this on a later post – below is an image of him and Ernie, our other horse, as a taster!